See the words dream, dreaming.... in there? and all over my fingers! Ouuu here's one! & another! I heart it! very cool! don't you just love rub on's? Nice pendant! I'm sure you will make every one of the things you listed (with your own cool twist)... and loads of other things the rest of us haven't even thought of yet. 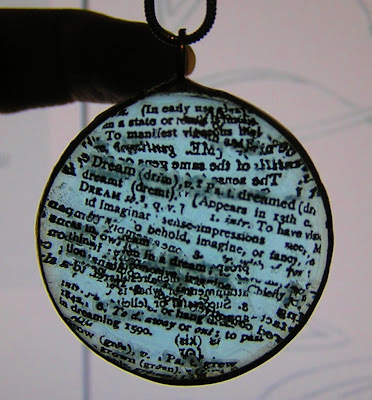 WoWzA, Mel-A-Licious, I just love your palimpsest pendant, which typically is a manuscript of papyrus or parchment, that has been written on more than once, with the earlier writing incompletely erased and often legible. But what do I know! Love this!!! You a genius!! So original, I love it! The colour is gorgeous!! I also love the items on your list. My favourites being the scrabble ring and the pure lunacy t!! Etsy is such a funky place. My DD & I went to Kensington Market in Toronto one Saturday and found all kinds of cool things including scrabble jewelry! Your creativeness never ceases to amaze me! Looks cool now, have you worn it yet? It is so cool, and your too funny. Looks fab and don't you love those deals..
Wow, Mel. . .you are so versatile!! I love how you are so creative in so many different areas! I love your pendant! It's so pretty! I would never have guessed that the words were created with rub ons! I think I would have a lot of fun crafting with you in real person!! I love the idea of doing different craft stuff. I used to design baskets, paint, swe, etc. . .now a days. . .I only paper craft!! I love your pendant! Thank you for showing another use of rub-ons! Really liked the dreams on your list! I'm back again ;-). I was thinking today. I just purchased a sigg water bottle, which is metal and I'd love to add some rub ons to it. Are there certain brands that you would recommend? And I think that I would need to put a protective coating over top so that I can wash it. Any thoughts? very nice Mel, and a one of a kind just like you. I know you will have all of that list completed in no time, you crafting wizard. this is AMAZING!!!! I'm totally in love with it. This is so awesome! I love it! You rocked on this challenge!